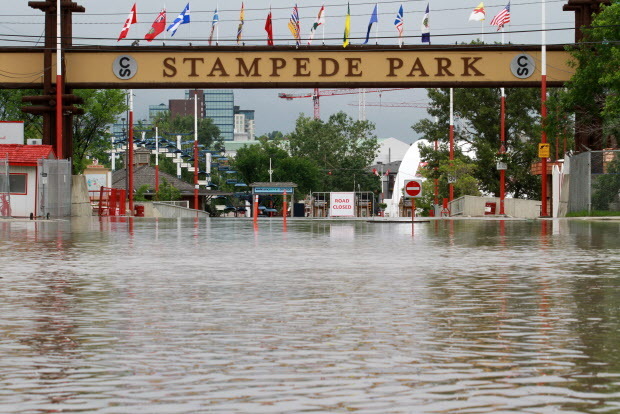 Calgarians will never forget the great flood of 2013, not just because it is the greatest and costliest disaster they have ever endured, but because it could be a turning point in attitudes towards the waxing and waning threat of Climate Change. Alberta is not known for embracing this idea; indeed, it’s a veritable power centre of climate change deniers. And that would include Prime Minister Harper, who pronounced the epic flood ‘stunning’. But the forbidden question, what does climate change have to do with the disaster, is hardly ever confronted and dealt with in a straightforward manner. Waffling and evasion, half truths and half lies, which have characterized the debate so far, continue even when the evidence is in. Yes, Calgarians and Climate Deniers everywhere, this disaster is indeed intimately connected to Climate Change, and it was foretold. For a detailed run down of scientific predictions, read Andrew Nikiforuk’s article in the Tyee, Calgary’s Manhattan Moment. While the clean up and frantic efforts to make ready for the annual party, the Calgary Stampede, continue round the clock; the main stream media is weighing in on what it all means. Unlike Nikiforuk, who is one of the few voices to bring reason and clarity to the climate change debate, the CBC wallowed in the usual confusion. During the very first round table of talking heads convened during the height of the flooding by Wendy Mesley of the CBC TV News, the editor of the Huffington Post opined that belief in Climate Change was an ‘opinion’ that one could hold or not. Really? Scientific facts are now a matter of ‘opinion’? She just slipped that in, and Wendy did not challenge her on this preposterous remark. But it is typical of the kind of dangerous distortions that are routinely made when Climate Change or Global Warming is under discussion. The wide spread confusion on this topic must be laid squarely at the feet of our lazy main stream media. They have done a miserable job on the most important topic of our time. Yet, even without the benefit of good journalism, there are signs that attitudes are changing. What’s more, cities are spending money on preventing floods and other foretold climate disasters. Mayor Bloomberg of New York has just announced a $19.5 billion plan to prepare his city for more Sandy type storms. He has heard the warnings, and he is preparing for the worst scenarios. And he is not alone; since 2004, no less than 7 major cities around the globe are putting similar plans in place. The most democratic and daring is surely the plan that London’s charmingly disheveled mayor, Boris Johnson, launched in 2011. Telling Londoners that they must ‘either grow gills or adapt’, he launched a website where citizens can offer solutions to the expensive problem of making London flood safe and set aside a fund of billions to actually do something about those ideas. Most recently, he announced a competition for the brightest minds to come up with ideas to reduce London’s carbon footprint. In 2008, Mayor Daley began a systematic program of ‘greening Chicago’ that includes sustainable buildings, advanced storm water management and roof top gardens, among other initiatives. During the same year, Rotterdam earmarked $40 million Euros towards the development of floating bubble shaped platforms of 12,000 square feet each, to give citizens a place to flee to when floods inundate the city. Even so called underdeveloped places like Ecuador have gotten the message. In 2007, the city of Quito began a $350 million project to green the city. Which brings us back home. Will Calgary and its extremely wealthy elite in the flooded downtown core take a hint and follow the lead of London, New York and Quito, or will it continue to cling to a dangerous and false view of reality? Will Hubris and Denial triumph over Reason and the principle of protecting and sustaining human life?